Navigating the tax system is complicated enough for many people living in the United States, but it can be particularly complex for international students, scholars, and faculty. Swarnali Sharma had a difficult case after she filed as a J-1 Research Scholar from India. Sharma did everything right; she filed in early February of 2017 and patiently waited for the refund check. By April, she still had not received her check and contacted the IRS to find out why. With no definitive answers, Sharma contacted the Tax Assistance Program (TAP) at the University of Notre Dame. “I was facing a really complex situation and I needed support,” recalls Sharma. Joseph Zavisca is the international program manager for TAP and offered to take on her case. By June, she still had not received her refund and he wanted to figure out what was holding it up. It turns out, the IRS made a data entry error and applied her refund towards her 2018 taxes. Zavisca and Sharma could not get the IRS to fix the error over the phone, so they made a visit to the local IRS office in downtown South Bend. An IRS employee confirmed the data error and corrected it weeks later. On July 15, Sharma finally got her refund. “This is what we are here for; we go to battle for our students and scholars with complicated cases,” says Zavisca. The Tax Assistance Program, managed by Zavisca, supports the reporting and compliance needs of international students, researchers, visiting scholars, and visiting faculty. Services also include support and assistance related to income tax controversy matters. Started in 1999, the program is led by Professor Ken Milani of the Department of Accountancy in the Mendoza College of Business. Milani also teaches a graduate accounting course, where a sizeable part of coursework involves preparing tax returns for international students and scholars. 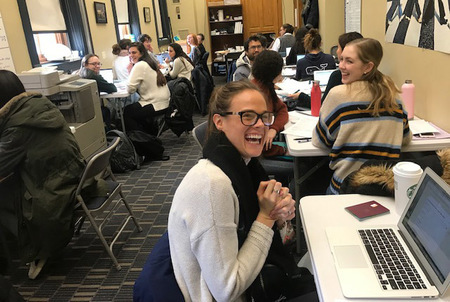 Graduate students set up office hours at LaFortune during tax season and each student prepares federal and state tax returns for roughly 45 clients. 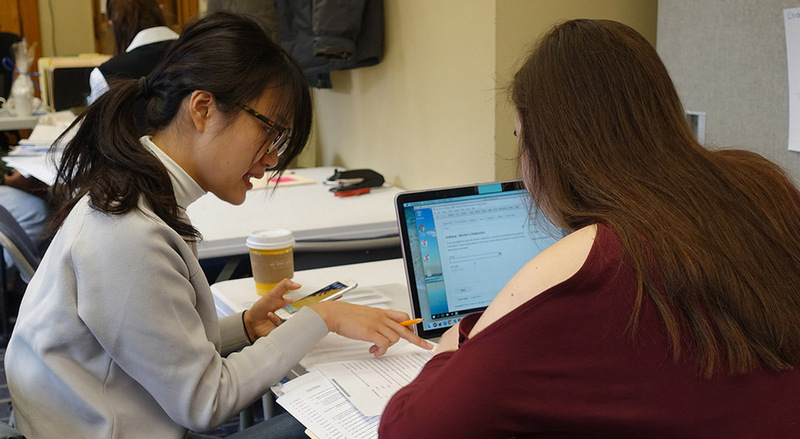 Graduate students set up office hours at LaFortune during tax season as part of their coursework. With the help of these graduate students, Zavisca says their team was able to serve 1,116 clients last academic year. There’s an education component to this program as well, as every case is different for their clients. For one, all international students and scholars have to file tax forms, even if there is no reported income. This includes all research scholars at Notre Dame, especially those on F-1 and J-1 visas. If their clients do have reported income from the US, they are asked to fill out a form and bring a copy to their appointment. They also need to provide a social security card (if they have one), a passport and visa, I-20 or DS-2019 form, and an I-94 form. This is in addition to their income documents, such as a W-2 form. Joseph Zavisca is the international program manager for the Tax Assistance Program. Zavisca says it gets even more complicated when students have paid internships in other states. He recently assisted a student who worked at Notre Dame, but also worked a summer internship in New York. The student paid income taxes in New York, where the money was earned. However, Zavisca says the state of Indiana didn’t see it that way and forced the student to pay taxes in Indiana from money earned in New York. Zavisca’s team fought the state and requested that the money be returned to the student. They not only won the case and the student was awarded money from the state of Indiana, but they also won agreements for students regarding income earned in other states in all cases moving forward. The team is also known for catching and correcting errors, which is the case for Paola Uparela Reyes, a graduate student with the Romance Languages Department. Last year, Reyes was told that she owed $13,000 in taxes. After reaching out to the TAP team, a critical mistake was discovered. It turned out that she was actually owed money, and shortly after received her reimbursement. Reyes says she has used the program for the past two years, and she’s eternally grateful for the support from Zavisca. “As an international student, I had no knowledge of taxes,” says Reyes. While there are several success stories, some cases can last longer and require additional support and resources. In Sharma’s case, she is now working in India, but will still need to file taxes for the 2018 cycle. She’s thrilled to learn that Zavisca and his team are still willing to help remotely. “I am just so grateful for their help and support throughout the entire process,” says Sharma. 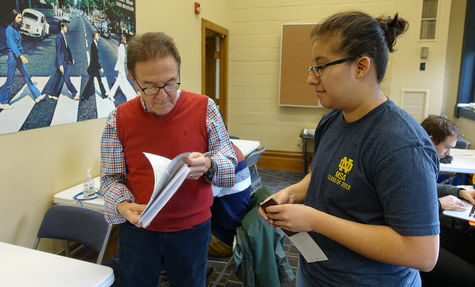 The Tax Assistance Program is also available to residents in St. Joseph County, as well as Notre Dame and Saint Mary’s students who are US citizens. Learn more about the program and who qualifies for tax preparation assistance. Originally published by Colleen Wilcox at international.nd.edu on February 28, 2019.